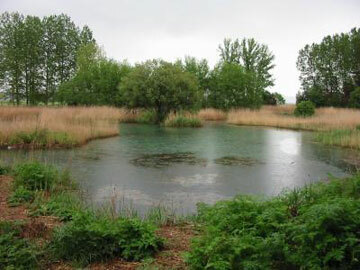 Restored wetlands like this pond converted from agricultural use in Aragon, Spain, may look natural, but a new study shows that it can take hundreds of years for restored wetlands to accumulate the plant assemblages and carbon resources of a natural, undamaged wetland. Photo by: David Moreno-Mateos/UC Berkeley. Looking at over 124 studies on wetland restoration covering 621 wetlands around the world (though 80 percent of them were in the U.S.), the study found that 50-100 years after restoration, wetlands still stored 23 percent less carbon and had 26 less plant species than pristine wetlands. On average restored wetlands were a quarter less productive than original wetlands. The study also found that wetlands in colder regions took longer to restore ecosystem services than those in warmer areas. Not only do wetlands preserve biodiversity and store carbon, they also act as water purifiers, help prevent erosion, and are important flood controls. CITATION: Mateos-Moreno D, Power M. E, Comin F. A, Yockteng R (2012). Structural and functional loss in restored wetland ecosystems. PLoS Biol 10: e1001247. doi:10.1371/journal.pbio.1001247. (01/04/2012) It may appear unintuitive that special toilets could benefit hippos and other wetland species, but the Center for Rural Empowerment and the Environment (CREE) has proven the unique benefits of new toilets in the Dunga Wetlands on Lake Victoria’s Kenyan side. By building ecologically-sanitary (eco-san) toilets, CREE has managed to alleviate some of the conflict that has cropped up between hippos and humans for space. (12/12/2011) Saved from being converted into a vast palm oil plantation by PALM-CI in 2009, the Ehy Tanoé wetlands and forest in the Cote D’Ivoire (Ivory Coast) is home to three gravely endangered primates and as well as many other species. 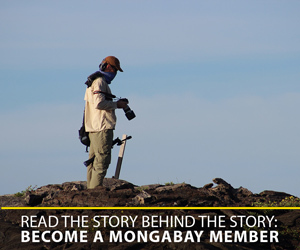 Since 2006, a pilot community management program has been working to protect the 12,000 hectare area, and a new study in mongabay.com’s open access journal Tropical Conservation Science finds that long-term conservation of the Ehy Tanoé wetlands and forest is, in fact, vital for locals who depend on the area for hunting, fishing, firewood, building materials, and medicinal plants. In addition, the study finds that the ecosystem has special cultural and spiritual importance to locals. (10/02/2011) President Obama’s sole focus of his September 8th speech to the United States Congress was job creation. He closed his speech by summoning an earlier time of promise: “President Kennedy once said, ‘ Our problems are man-made—therefore they can be solved by man. And man can be as big as he wants.’ These are difficult years for our country. But we are Americans. We are tougher than the times we live in, and we are bigger than our politics have been. So let’s meet the moment. Let’s get to work…” Inspiration is surely needed because in addition to the United States, where unemployment remains at about 9 percent, severe unemployment is found throughout the world, with Greece, Spain, and South Africa, for example, having 2011 summer unemployment rates at over 16, 20, and 25 percent, respectively.